Visit of Sigurður Ingi Jóhannsson, Icelandic Minister for Fisheries and Agriculture, and Minister for the Environment and Natural Resources, to the European Commission. Round table: (from left to right) Thórir Ibsen, Head of the Mission of Iceland to the EU, Sigurður Ingi Jóhannsson, Maria Damanaki EU Commissioner for Fisheries and Andreas Papaconstantinou, Member of the cabinet of Maria Damanaki. (EC Audiovisual Services). Sigmundur Davíð Gunnlaugsson, the Prime Minister of Iceland, hardened by adverse weather and isolation as all his compatriots, when in Brussels last summer, delivered two lessons to EU bureaucrats and dignitaries, softened by indoor life. He taught them how to treat fraudulent bankers and who to fish mackerel. Yesterday tiny Iceland accomplished its teaching course of how to treat fraudulent bankers, by sentencing three former top managers and the major shareholder of the Kaupthing bank for up to five years in jail. 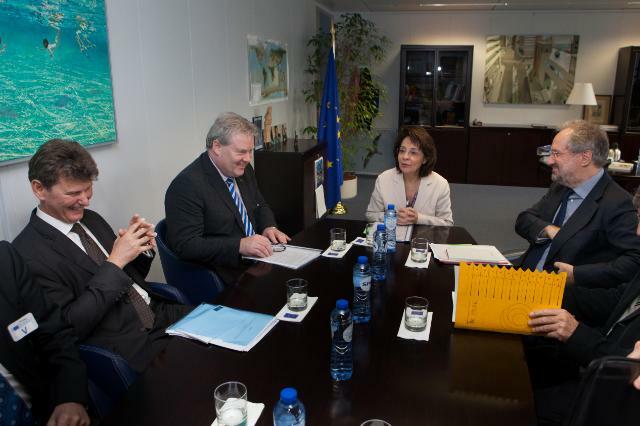 They are the former CEO of the bank, the chairman, the majority owner and the head of the Luxembourg affiliate. Kaupthing along with Landsbanki and Glitnir, the three major Icelandic banks, went bankrupt in 2008, affected by the spillovers of the great financial crunch that first erupted in the US. Unlike the rest of the western countries, however, Iceland’s taxpayers didn’t cover the losses of those careless banks neither did they compensate their equally careless creditors. The three banks had borrowed many times the GDP of Iceland and the country’s government decided to let them rot along with their creditors and high yield seeking depositors. At the same time Iceland took extraordinary measures to protect the weaker part of the population during the hard times that followed. The national money was greatly devalued and fuel and food suddenly became very scarce. In any case, Iceland has now fully recovered, due to the hard work of its people and by applying the right economic policies. On the contrary Ireland, when confronted with exactly the same problem – when the Irish banking system collapsed – was forced by the European Central Bank to borrow around €90 billion and instructed to bail out all fraudulent bankers. Of course the Irish people paid a dear price for that, with three years of austerity policies, deep economic recession, devastating unemployment rates and a sovereign debt that has now reached 120% of the GDP. As a result, the country’s taxpayers will be burdened all along the next twenty to thirty years to repay the debts of the bankers. In the case of Iceland after the first difficult year, the economy started to recover and the country owes nothing to anybody. On top of that, Iceland’s penal system found the bankers of Kaupthing guilty of fraud. They hide the fact that a foreign investor, who had bought a large stake in their bank weeks ahead of the fall, had done so with a loan from this same lender. The remote island country didn’t escape that easy from the wrath of the major world banks, which controls countries and governments. Iceland was attacked by Britain and Holland for not having compensated their own citizens who had deposited and lost money in the Icelandic banking system. This was the famous Icesave affair. However, the European Free Trade Association (EFTA) Court where Britain and Holland took their case, rejected all , that Iceland should be declared in breach of the European Economic Area Agreement. The Court also rejected the claim that Iceland has breached the EU Deposit Guarantee Directive or has discriminated against depositors contrary to European Economic Area law. London and The Hague were called to pay for the judicial costs. The decision was final because there is no appeal. Last but not least, it must be mentioned that the four above mentioned bankers were charged to pay millions in judicial expenses. It must also be noted that there are more penal cases against Iceland’s bankers. Unfortunately, this is not the case in other western countries where the banks drove the economy to chaos back in 2008-2009.